Mustafa Kemal Ataturk, a highly respected army general, led the Turkish people in their War of Independence (1919-1923) against the allied occupiers. Ataturk’s outstanding leadership qualities were first recognized during the 1915 Çanakkale Battle (also known as the Gallipoli Battle, or Dardanelles Campaign). After numerous victories by Turkish forces on many fronts between 1919 and 1922, the occupying forces were defeated. In 1923, the Republic of Turkey was established. As the leader of the new nation, Ataturk created the foundations for a modern, secular and democratic country. World War I (WWI) was a global military conflict that took place between 1914 and 1918. The war, which left millions dead, led to the creation of the modern world. The Allied Powers, led by France, Russia, the United Kingdom, and later Italy and the United States, defeated the Central Powers: Austria-Hungary, Germany, Bulgaria and the Ottoman Empire. By November 1914, the Ottoman Empire had joined the Central Powers as the result of a Ottoman-German Alliance. The British and French opened another front in the South with the Gallipoli (1915) and Mesopotamian campaigns. In Gallipoli, the Turks were successful in repelling the British, French, and Australian and New Zealand Army Corps (ANZACs) and forced their eventual withdrawal and evacuation by 1916. After the Armistice of Mondoros, the countries that had signed the agreement did not consider it necessary to abide by its terms. Under various pretexts the navies and the armies of the Entente (France, Britain and Italy ) occupied Istanbul, while the province of Adana was occupied by the French, and the British occuped Urfa and Maraş. In addition, British soldiers were in Merzifon and Samsun, and Italian soldiers were in Antalya and Konya. On the 15th of May 1919 the Greek Army landed in Izmir in accordance with the Allied powers. The Turkish War of Independence began under these difficult conditions on the 19th of May 1919 when Mustafa Kemal landed in Samsun. It is after this date, which marks the beginning of the Turkish War of Independence, that a national resistance arose across Anatolia. Mustafa Kemal became the leader of the national struggle movement which quickly grew in strength. 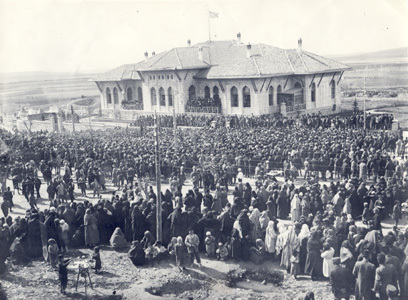 Once the congresses in Erzurum and Sivas were held in the summer of 1919, the objectives of the national pact were declared. When foreign armies occupied Istanbul on the 23rd of April 1920, Mustafa Kemal inaugurated the Turkish Grand National Assembly and established a provisional new government whose center was Ankara. On the same day, Mustafa Kemal was elected President of the Grand National Assembly. The Greeks started to advance towards Bursa and Eskişehir. On the 10th of January 1921, the enemy forces were heavily defeated by the Commander of the Western Front, Colonel Ismet and his troops. On the 10th of July 1921, the Greeks launched a frontal attack with five divisions on Sakarya. After the great battle of Sakarya, from the 23rd of August to the 13th of September, the Greek Army was defeated. After the battle, the Grand National Assembly gave Mustafa Kemal the titles of Ghazi and Marshal. Mustafa Kemal, who was determined to drive the foreign occupiers out, ordered a decisive attack which was launched on the 26th of August 1922. Enemy forces were surrounded, killed or captured on the 30th of August at Dumlupınar, and by the 9th of September 1922 the fleeing enemy forces were defeated in Izmir. On the 24th of July 1923, with the signing of the Treaty of Lausanne (Lozan Antlaşması ) the independence of the new Turkish state was internationally recognized. On the 29th of October 1923, Atatürk declared the new Turkish state a Republic. Following the declaration of the Republic, Mustafa Kemal was elected Turkey's first President. He is remembered as an outstanding soldier, commander, statesman, nation-builder, reformer and educator. It was under the extraordinary military skill of Atatürk, and his commanders, that the Turkish nation fought a War of Independence against the occupying Allied powers, which led to the victory of the Turkish nation, and emergence of modern Turkey. To understand how Atatürk’s legacy is a part of contemporary Turkish society, it is essential to understand how his spirit is not only very much alive, but deeply embedded in the Turkish national consciousness. The reason for this is not only because of what Atatürk did to keep the Turkish nation together, but also for what he bequeath the Turkish people--a modern day nation with the laws and principles needed to democratically govern future generations.